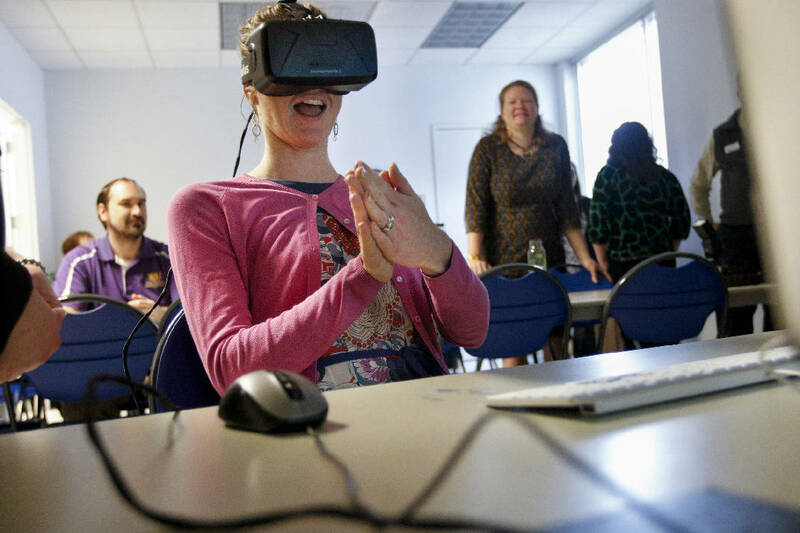 Andree Herbert tries out the Oculus Rift virtual reality device on March 20, 2015, in a classroom at the Tennessee Aquarium IMAX Theatre in Chattanooga. The Oculus Rift is a virtual reality device, and the aquarium is using a development kit version to build VR programming which teaches students about stream ecology conservation. On Monday, representatives from Tennessee Technological University will be at the Tennesssee Aquarium to show off the River Ecosystem Conservation virtual reality experience. A demo unit will be set up in the lobby of the River Journey Building from 10 a.m. to 2 p.m.
* 1962: Morton Heilig patents the Sensorama Simulator, an enclosed booth in which viewers are shown short films that "stimulate the nervous system" with a combination of 3-D images "binaural sound, breezes, odor and tactile sensations." * 1965: Ivan Sutherland, director of the Information Processing Techniques Office of the Advanced Research Projects Agency, creates The Sword of Damocles, a head-mounted display that changes the image by tracking the user's head movement through a headset attached to a mechanical arm suspended from the ceiling. * 1984: Jaron Lanier, a former Atari employee credited with popularizing the term "virtual reality," creates VPL Research, the producer of VR equipment such as the EyePhone head-mounted display and the DataGlove, a gloved device that simulates tactile sensation and manipulation of virtual objects. The equipment later is used by NASA for training simulators. * 1991: Video game software and hardware maker Sega announced ongoing work on Sega VR, a never-released console featuring a 3-D, head-mounted display with surround sound and head tracking. * 1991-1993: Virtuality Group (founded in 1985) releases a series of VR arcade machines using head-mounted displays, 3-D movement tracking, data gloves and enclosed cabinets. * 1995: VR devices released include Nintendo's Virtual Boy console, VictorMaxx Technologies' CyberMaxx headset and Virtual IO's I-Glasses. * 1999: Sci-fi action film "The Matrix" is released, proposing a world in which all of humanity are slaves to a shared virtual reality experience controlled by intelligent machines. * 2012: Oculus Rift is introduced through a Kickstarter campaign that raises $2.44 million, about 10 times its initial $250,000 goal. * 2014: Facebook acquires Oculus VR for $2 billion; a host of companies announce plans for competing VR headsets. After checking to ensure her snorkel is securely attached, Andree Herbert pauses on the edge of the Conasauga River to glance down at the grass sloping into the water. "Look at all the little mushrooms," she murmurs appreciatively, turning her gaze in a slow pan along the horizon before stepping off the bank. A surprisingly fast moving current immediately sweeps her downstream. Unconcerned, she allows it to carry her, peering around as lush vegetation and trout flow past. But something isn't quite right. The sky is too blue, the water too clear. Above the surface, the greenery seems so eye-poppingly lush that it can't possibly be real. Herbert isn't snorkeling. She's sitting, completely dry, miles from the Conasauga in a classroom in the Tennessee Aquarium's IMAX 3D Theatre. Outside the windows, a low bank of weepy gray clouds are a far cry from the azure blue she's seeing. The cherubic cumulus puffs above her head are the product of programming, not water vapor. Her window into this pristine, too-good-to-be-true landscape is an Oculus Rift virtual reality headset, a black device that looks like a fat sleep mask strapped to her head and connected to a nearby desktop computer. The aquarium's director of development and membership, Herbert is testing out a virtual river simulator that was created as a prototype VR experience for the aquarium by a team of students at Tennessee Technological University. When it goes live this fall, educators who visit the aquarium will be able to sign their classes up to embark on a digital snorkeling excursion that will let them experience "first hand" the effects of environmental calamities on waterways. Behind the mask, monitors in the headset aligned to each of Herbert's eyes project a 3-D image that dominates her field of vision. Wherever she looks, a position-tracking camera mounted above the computer and a suite of sensors in the headset mimic her movements in a sinuous fashion no mouse could emulate. She's absorbed in the experience. When a catfish swims within inches of her digital cheek, her hands rise out her lap in an almost unconscious attempt to touch it. The Oculus mimes the motion of her head seamlessly; the catfish swims on, unperturbed. The experience Herbert is having may soon be replicated in living rooms around the country. Industry analysts predict the near-future release of the Oculus Rift -- currently predicted some time in 2016 -- and a host of competing virtual reality devices soon could transform immersive computing from a decades-old, science-fiction pipe dream into a mainstream reality. "It's simply a matter of time; I'm 100 percent confident of it," says Aaron E. Walsh, a professor at Boston College and long-time proponent of virtual reality technology. Walsh has been a fan of immersive computing -- the technical name for VR -- since he and a colleague built a homebrew VR machine at Boston College in 1990. It employed a 3-D headset and used a motion-sensing Nintendo PowerGlove controller to let them, among other applications, play a game that involved piloting a spaceship through a virtual maze. The graphics were rudimentary, but the experience changed the course of his life and career. "It was exhilarating, absolutely exhilarating, and it was nowhere near the kind of virtual reality quality that we're starting to get today," he says. "That was all I wanted to work on from that point forward." In 2005, Walsh became director of the Immersive Education Initiative, a 6,000-member global nonprofit consortium of universities, colleges, research institutes and companies seeking ways to leverage technologies like VR in the classroom. In all, he says, initiative members represent "several million students" who soon will be able to take advantage of bleeding-edge educational opportunities like the aquarium's virtual conservation program. "The students we teach are very excited about it," he says. "[Virtual reality] gives you the opportunity to do things you simply can't do in the real world. A student studying DNA in school with virtual reality won't just see a DNA strand, click it and spin it with their mouse; they actually stand in the middle of the DNA strand and use their hands to spin it around them. "That ability to amplify the experience can't be understated." Herbert's dive into a virtual Conasauga is one of many early glimmers that virtual reality is poised to finally -- after decades of false starts -- become a household fixture. Walsh says VR's potential impact could be on the same order as the smartphone. "It's probably the same as seeing the television for the first time or moving pictures," he says. "It's as powerful as never having seen a movie before and suddenly seeing moving pictures on a screen. It's that big of a difference." Last year, Facebook spent $2 billion to acquire Oculus VR, the makers of the Oculus Rift device Herbert wears during the aquarium's prototype test. In a March 25 post to his profile, Facebook CEO Mark Zuckerberg wrote that, when used in coordination with existing communications technologies, virtual reality could fundamentally change the world. "Imagine enjoying a courtside seat at a game, studying in a classroom of students and teachers all over the world or consulting with a doctor face-to-face -- just by putting on goggles in your home," Zuckerberg wrote. "By feeling truly present, you can share unbounded spaces and experiences with the people in your life. Imagine sharing not just moments with your friends online, but entire experiences and adventures." The acquisition of Oculus VR was just the beginning. At the Game Developers Conference in March 2014, Sony announced Project Morpheus, a VR headset slated for release in the first half of 2016 which will bring immersive gaming to its Playstation 4 game console. At this year's conference, mobile device maker HTC premiered the Vive, a headset it created in collaboration with Steam, a major digital PC gaming platform. In January, Microsoft premiered the HoloLens, a virtual/augmented reality system that allows users to interact with a virtual computer interface overlaid on the world around them. Other major companies to enter the VR fray include Panasonic and Google, which announced last October that it had invested more than half a billion dollars in Magic Leap, a secretive startup working on a brand of VR it calls "cinematic reality." It's this wave of support from major companies that gives VR supporters hope that the technology will actually come to fruition. "That's what makes it, for the first time, truly believable," Walsh says. "If it was just one of them, you might step back and say, 'Let's wait and see,' but when it's that many of them, on top of the smaller companies, you can tell." Analysts at Digi-Capital, a technology consultant and marketer, predict VR will land with a both a resounding boom and a mighty ka-ching. In a post published earlier this month by TechCrunch, Digi-Capital Managing Director Tim Merel says his company predicts virtual and augmented reality -- such as Microsoft's HoloLens -- could generate a combined revenue of $150 billion by 2020. "VR/AR in 2015 feels a bit like the smartphone market before the iPhone," Merel writes. "We're waiting for someone to say 'One more thing ...' [like former Apple CEO Steve Jobs] in a way that has everyone thinking, 'So that's where the market is going!'" This isn't the first time VR has seemed poised for greatness. Scientists and researchers have been toying with the idea of a fully immersive computing experience for more than a half century. The last boom of interest in virtual reality came in the 1980s, when consumer electronics shows and trade publications featured companies showing off clunky, plastic headsets with boxy displays protruding massively from the user's forehead. Two major obstacles have been in the way of VR's acceptance, experts say: price and quality. The cost of even a rudimentary VR experience 30 years ago required investment in a graphics workstation, which cost about $50,000, Walsh says. Combined with the low-resolution, pixelated graphics that screens at the time were capable of creating, VR was a prohibitively pricey, underwhelming experience. "Flash forward to today, and ... you can actually get a true [high-definition] screen to each eye now, so your quality has gone way, way up and the cost has dropped down to the bottom," he says, predicting a price point for most headsets at $299 or less. The experience of VR, however, still has a ways to go before users are experiencing its full potential, fans say. Chattanooga-based solutions engineer Matt Brown, 28, has been a fan of virtual reality for years. In 2014, he was able to test it out for the first time through Oculus Rifts that had been set up at a sales conference he attended in San Francisco for his company, user-interface developer Skuid. There were two demo units. One allowed users to sit inside a virtual car and change the colors and materials. The second showed data manifested on a 3-D globe that could be manipulated. Brown says neither of these programs was exceptionally impressive. Yet, like most fans of the technology, he seems willing to wait for their promise to be realized. "They were clunky and weren't very well-built, but it was still very cool," Brown says. "I know that when I actually get a chance to try it with something cool, that will be a 'Wow' moment. It's still revolutionary, but I definitely want to try it with something else." He sees a near-future where VR is used for everything from virtual tourism to its implications for gaming, which is where much of the early groundwork in VR was focused. "I think it will become basically the next smartphone," he says. "That may be 10 years out -- I don't know -- but I think everything will collapse into it. There are all kinds of other applications for it. I think it's just a matter of time." Virtual reality already is being used in a wide range of applications, from training tank drivers in the Norwegian Army to helping amputee patients cope with phantom limb pain to helping surgeons practice their techniques on virtual patients. And virtual snorkeling, of course. "I think [virtual reality] could really make a huge difference in conservation education," says Emily Samples, a 19-year-old environmental science major at Tennessee Tech. Samples is one of the students who helped to design the aquarium's VR prototype. Entering the project, the development of which began five months ago, she knew nothing about the technology, but she says she now recognizes its potential to dramatically alter how conservation messages are conveyed. As an example, she cites a 2011 study by Stanford University in which users were tasked with cutting down a Sequoia tree in the campus' Virtual Human Interaction Lab. Those who cut down the virtual tree -- complete with a vibrating controller to simulate a buzzing chainsaw -- were more likely to reduce their paper consumption than a second group who only read about how unrecycled paper contributes to deforestation. "Conservation education in the classroom right now is PowerPoint demonstrations and discussion papers and talking about it," Samples says. "I think that this way of showing how things work is going to make it more emotional." Behind her in the aquarium classroom, Herbert continues her snorkeling excursion, and things are taking a turn for the worse. The water becomes noticeably clouded. The picturesque schools of fish that have been swimming merrily by begin to die off. "This is so sad," she says. "What's going on here?" Clicking an arrow key on the computer's keyboard, project manager Amanda Ellis moves Herbert's avatar out of the stream. Back on dry land in the virtual, too-perfect landscape, she's confronted by a floating dialog box telling her that soil from a nearby construction site is to blame for the murky water. She's presented with a trio of possible solutions to the problem. After making her choice -- installing a silt fence around the construction site -- she jumps back in. Behind Herbert, Kevin Liska looks on with interest as Herbert discovers that the silt fence didn't quite do the trick (vegetation to control the erosion was the ideal solution). The founder of TTU's BusinessMedia Center, which facilitates projects such as the virtual river simulator, Liska says the hope is that creating immersive programs will impact real world behavior in ways traditional teaching cannot. "To allow people to get immersed into a river and experience the impact of different pollution sources, that's something that, without this technology, you can only talk about," he says. "Virtual reality is a better way of showing causes because people get more engaged in it. "It's more than somebody just telling you 'Here's a cause. There's an effect.'"